Interview with Samuel Sidibe, Archeologist and Director of The National Museum of Mali by Alliance Nyobia. The illicit trafficking of cultural property has lasted for quite a long time now. From when did it become a concern? This trafficking has been a persisting problem. During the colonial era, Africa was greatly stripped of its heritage, through warlike seizures, ethnological missions (or scientific if you prefer). But from the 1960’s, a significant trade likewise emerged. There were dealers circulating everywhere in Africa to buy objects at very cheap prices; objects they would later resell in Europe. I believe that it is from the 1970’s African States started to really think about the issue. They therefore worked in conjunction with UNESCO, to set up the 1970 convention, focusing to put an end to the illicit exportation of heritage, and to set up an international cooperation for the conservation of heritage. The phenomenon experienced a great magnitude during the colonial era, but it continued to grow for several reasons. First, the States were not adequately vigilant, by putting up museums, adequately creating staff, and by promptly releasing funds for the conservation of heritage, and to counter the illicit trafficking phenomenon. Who bears the responsibility for this trafficking today? Firstly, trafficking is born from a strong demand from outside. There are private collectors, some museums to some extent, which are interested in this heritage, these African objects, which have acquired, over time, the status of art objects. Which ones can be worth a considerable amount in the international market? Let me give you a case of a Malian object which was sold for one  million CFA in Bamako, but was proposed for about 40 million CFA as soon as it arrived in Europe. There is a real demand. Which are these consumer countries? 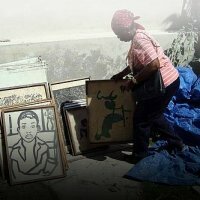 The same old countries from the North: France, Belgium, Unites States etc rich countries where a lot of [dealers, museums, private collectors] are interested in these African art objects. This happens at the expense of Africa. Currently, it is estimated that 90% of Africa’s heritage is already in Europe. If nothing is done so that this phenomenon is stopped, we will be stripped of everything. It is therefore important that African States-if they are interested in the safeguarding of our memory-should set up real operational institutions. African museums nowadays still lack a lot of things.